The Zebra Mouse (also known as the African Striped Grass mouse) originally comes from North Africa. They live in small colonies in tall grassy areas located close to rivers and water holes. Being that they are social by nature, as long as they have been used to being handled by the breeder, a Zebra mouse can make a good pet. As with many other desert dwellers Zebra Mice do not have an offensive odor. They are quite clean in the toilet habits and require very little maintenance. The Zebra mouse is considered diurnal (active both during the day and at night). A full grown Zebra mouse is 3-4 inches long. When startled they will bounce around and they can jump 24” or more. In captivity, when cared for properly, Zebra mice can live up to 3 years. 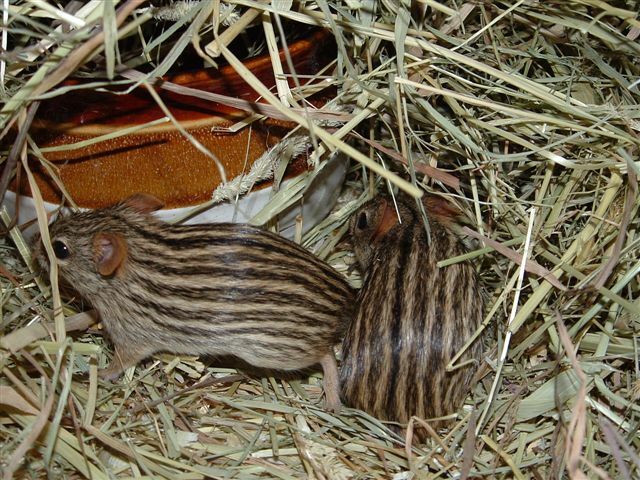 A 10-20 gallon aquarium is suitable for the Zebra mice, with a thick layer of Aspen or Pine bedding and lots of good quality hay for them to build a nest, is a must. Water must be available at all times. Their diet is fairly simple, a good quality rodent mix and a few rodent blocks should be available at all times. On occasion and in very small amounts, fresh greens can be offered. Sometimes, for extra protein, I sprinkle a bit of Skim milk powder over their seed. Like most caged pets, Zebra mice need a good quality vitamin supplement and a mineral block which actually helps them (and other Small pocket pets) keep their teeth in shape. A Zebra mouse should have a wheel in its cage to exercise on. The wheel should be at least 5" in diameter and solid as opposed to wire. As additional tank accessories, non toxic, disinfected branches for them to play on and solid platforms are ideal. I do provide a large tube for them to use as a house but most times they prefer to use the hay, which they make elaborate nests out of. 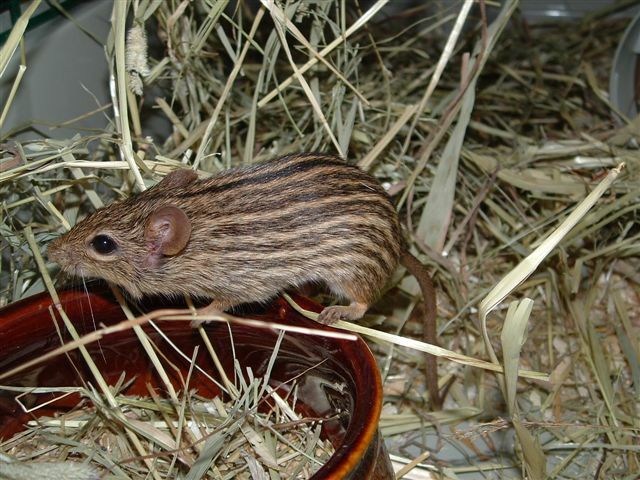 Zebra mice are considered quite rare and they range in price from about 30.00-50.00 each depending on availability.